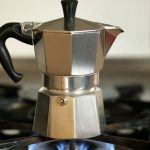 Unless you are among the 0.66 percent of the American populations who suffer from Phantosmia (smell hallucinations), any smell coming from your home should be a cause for concern. The commonest source of such smell is the kitchen. It is particularly true if you frequently cook on a high-powered stove. That’s where the best range hoods come in. Range hoods vent the smoke that causes the bad smell. They also trap grease resulting from certain styles of cooking. A good quality range hood is a vital part of any kitchen configuration. It offers the most assured way to remove dangerous smoke and odors from the kitchen. You now know why you badly need to install a good range hood in your kitchen configuration. But without experience and knowledge, reaching the decision of which particular brand or model to buy can be problematic. We are here to help. We have conducted an in-depth research of the various brands of range hoods currently available in the market. We have also read several best range hood reviews to help us make helpful shortlist just for you. The Broan 413004 belongs to a series of non-ducted under cabinet hoods made to meet the highest environmental standards. It’s among the best in design quality and performance. The range hood offers optimal filtration giving your indoor environment fresh air at all times. The design of the device comprises a removable combination grease-charcoal filter. This offers a cleaner, safer indoor exhaust fan recirculation. There is also a fan optimized for years of service without requiring frequent replacement. Stainless steel construction is strong, rust-proof and durable. A protective lamp lens is fitted on the range hood to distribute light uniformly over your cook-top. For easy operation, the unit has control switches to help with fan speed adjustment as well as light activation. These features make the unit easy to use and maintain. 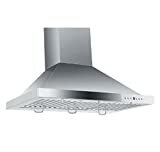 The Broan 413004 is one of the most economical range hoods currently in the market. It is 30 inches and will fit into your kitchen well and even give it a makeover. Its great performance can be attributed to Broan’s exclusive Microtek technology to filter airborne cooling pollutants and contaminants. You need to keep in mind that this range hood installs as non-ducted only with a charcoal filter. The lighting system is a 75-watt bulb. The bulb is sold separately. It can work in any ADA compliant application. The range hood sets up as 3-1/4-inch by 10-inch ducted opening with either horizontal or vertical ducting. It can also install as 7-inch round vertical ducting or even as non-ducted with air re-circulation. As with other Broan hoods, the F403011 is fitted with a high-quality two-speed fan that will serve you for years without replacement. Are you a serious homeowner who cares about the life and health of you and your loved ones? 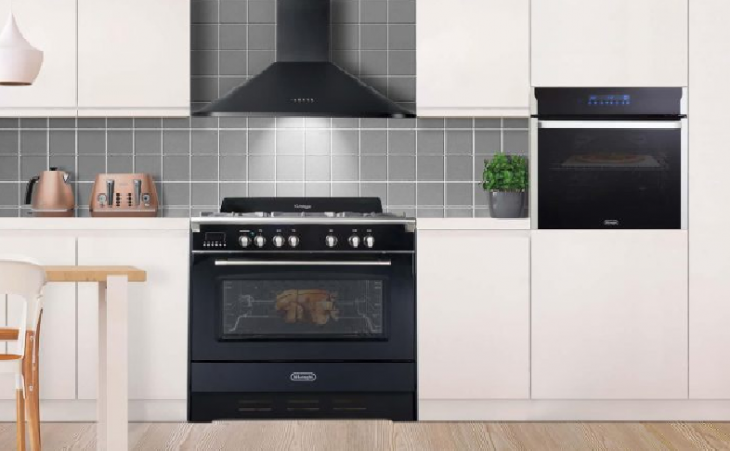 In case you are, dare to invest in a great quality range hoods such as the ZLine KB-36. Constructed of high-quality 430-brushed stainless steel, this hood will serve you for a lifetime without the need for replacement. This 36-inch wall-mounted hood is highly versatile. It is easily convertible to ductless. All you need to do is the optional activated charcoal filters that are sold separately. The unit is delivered with the blower and fan already installed and ready for use. The pre-install parts are factory tested to ensure they function flawlessly. The KB36 Wall Hood requires 110v/60Hz to work with an output of 1290 cubic meter per hour or 760 cubic feet per minute. The interior workings of the range feature 4-speed touch sensitive electronic filters. To make your cooking easier, the hood features nice and bright two 20w tilting halogen lights that illuminate the cook-top. A strong feature of this unit is the ZLine’s Baffle Filters. These filters will purify the air by removing smoke and grease. The great performance of the KB-36 is a function of its 760CFM four-speed motor featuring a timer and an automatic shutoff capability. The unit measures 36 inches x 19.7 inches x 10.5 inches. The BV under cabinet range hood is fitted with 2-watt assist lighting with two high-intensity energy-efficient LED bulbs. These are meant to illuminate your workspace so you see what you are cooking. The product measures 30-inches L x 22 inches W x 10-inches. Keep these dimensions in mind so that you can compare with the available space for installation in your kitchen. Enjoy a 3-year product warranty if you choose to buy this ducted range hood. You can be sure you are getting a good product because this range hood is cUL and ETL rated. Perfetto 30-Inch Convertible Wall Mount is perhaps the best range hood you can buy if you are looking for a versatile product. You can install it either in your kitchen or your bathroom. It will do the same great job of purifying your indoor environment to get rid of smoke, odor, and grease. 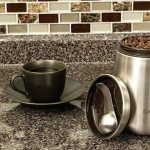 It is made of high quality brushed stainless steel that will not rust or corrode over time. This guarantees you years of air filtration without requiring replacement. The hood is fitted with a powerful 193-watt motor that drives a 3-speed fan capable of pushing air at a flow speed of 400 cubic feet per minute. 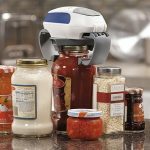 The powerful motor easily vents away smoke, grease, oils, and moisture. Perfetto is fitted with two high-performance mesh filers that deliver superior filtration. It features a convertible system for vented or ventless (ducted or non-ducted) recirculation. You are required to buy carbon charcoal filters to work with ductless (ventless) configurations. The unit measures 29.5 inches W x 18.5-inches L x 42-inches H.
You will love the hood’s stunning European Italian design. It is a super slim fanhood that will fit your kitchen or bathroom nicely giving it a facelift. The unit is so easy to install especially with the included do-it-yourself kit. The device is also very easy to clean because the filters are dishwasher safe. From the look, you can be sure you are getting the best kitchen range hood. The first feature that will strike you is the slim-saving design. It will save you space yet deliver you with the greatest performance. For the same reason, you can use the range hood in apartments as well as condos. Although ducted, you can easily convert the Cosmo Under Cabinet Range Hood to the ductless hood by buying an activated charcoal. The carbon filter kit optional but you can buy it when buying the range hood. The ductless option is great for back or top venting. This is because you can install the range hood both under the cabinet and against the wall. This unit is powerful yet it operates quietly. Its 3-speed fan produces a maximum of only 56 decibels. Such loudness cannot compare with most other models currently in the market. In order to work, the range hood will require 120V electricity and a 3-prong plug. Filtration is afforded by a durable recyclable aluminum mesh filter. Cosmo under cabinet hood measures 30-inches in width which is the common measurement in houses. This measurement is compatible with most homes. The full dimensions 29.75 inches x 19.75 inches x 5.5 inches. 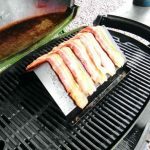 To guarantee durability, the unit is constructed from 20-gauge stainless steel that is 430-grade. The unit is also fitted with 2x3W LED bulbs for energy savings. The five-button controls are easy to operate. Fitted with a high-end LED assist lights are three times brighter than those of the most competing models, this wall-mounted wood from Kitchen Bath Collection is a wonderful choice. You’ll find its touchscreen control panel a luxurious addition. It can give your kitchen or bathroom a luxurious appeal. This 30-inch range hood features a double-piece adjustable chimney with stunning curved edges. You will see no welded seams at the edges. This smoothness gives the hood an elegant finish only seen with the expensive high-end models. Even more interesting is that all these high-end features have no impact on the affordability of the unit. The range hood features a 3-speed motor driving two aluminum micro-cell grease filters. These filters are dishwasher safe to give you no hassles when cleaning them for reuse. To assist you with your cooking, the unit is fitted with two high-quality LED lights each of which has 49 bulbs. This brightness is not comparable with many competing brands that feature only 15 bulbs per LED light. A flexible aluminum duct offers easy attachment to wall or ceiling. However, this range hood from Kitchen Bath Collection is capable of ventless installation. Unlike other brands, this conversion to ventless installation will require no additional installation kit. It comes with charcoal carbon filters. The powerful motor drives a high-quality fan capable of filtering cookstove smoke, grease, and odors at 860CFM. The inner settings feature a high-quality stainless steel baffle filter. The filter is very easy to clean. Simply remove it and throw it into the dishwasher. It is as easy to clean as that. Being a replaceable filter, you can expect it to last you a lifetime. A user-friendly touch screen displays a clock as well as an auto shut off function. The touchscreen advanced technologically and makes the range hood easy to control. A set of halogen lamps light your working space. This feature is a little different because most models are fitted with LED lights. If you buy this range hood, you will get a grease container. The overall dimensions of this hood are 30 inches x 7 inches x 22 inches. XtremeAir UL10-U30 is one of the best under cabinet range hoods you can invest in. This 30-inch unit will change the configuration of your kitchen while at the same time guaranteeing the safety of your household against the many negative effects of the smoke and odor coming from your cookstove. 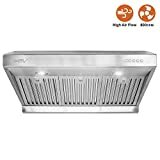 Made from high-quality non-magnetic stainless steel, this range hood will stand the test of time. The material can withstand heat, grease, smoke, and moisture. Its filtration unit consists of an efficient filter that will trap most grease, smoke, and odor leaving your indoor atmosphere fresh and healthy. Although it comes with halogen lights, you can successfully change them to LED for brighter illumination. A lovely feature of this range hood is its quiet performance. Even at its lowest setting, the hood will still work perfectly. 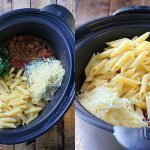 Since it has three settings, you can make fancy meals without any worries. Simply change the setting to medium or high and you are good to go. 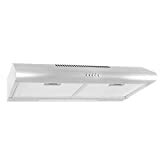 XtremeAir Ultra Series UL10-U30 is the best range hood to buy if you are looking for a good quality product without spending steeply. The hood looks gorgeous, fits perfectly, easy to install, works optimally and very easy to clean. It measures 22 x 29.8 x 9.8 inches. Proline Wall or Under Cabinet Range Hood is the last of our top 10 best range hood reviews not because it is the lowest quality of all. It is because if we had to rank them in one way or another. That said; this unit will capture your attention because of its wonderful design. The PLJW 185.30 super slim contour is ingeniously designed to save you space. 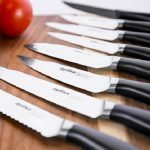 It offers a height of a paltry 5 inches which will be barely noticeable in your kitchen yet the overall configuration it gives will capture anyone’s attention. A lovely feature you will like to see in your kitchen is the unit’s cool light cascades from the built-in LED bulbs. The bulbs feature the newest 1.5 W GU10 LED which is preferred for their energy efficient nature and brightness. The lights will cover your whole range top. The unit’s dynamic and versatile design provides for multiple venting outlet choices. You can vent it out the back or top by removing the panels on its rear aspect. Although the PLJW 185.30 is armed with a powerful 4-speed motor of 600CFM, it operates very quietly. It is among the quietest range hoods in the market compared to others of its size. The unit is backed by Proline’s 3-year warranty on labor and parts. Did you find the reviews helpful? Have you found what you have been looking for? If your answer was in the affirmative in both accounts then you need more information to make a better choice. We do not intend to disappoint. Therefore, we are going to discuss a few important factors to keep in mind when you are out shopping for a suitable range hood for your kitchen. The first considerations when looking for the best range hood to buy are its shape, size, and mounting type. These features have a large bearing on how well the unit will install in your kitchen. The new hood you buy should be as wide as your cooktop or range and about 3-inches longer on both sides. The commonest range hood widths are 30 inches and 36 inches. As a general rule, the new hood you buy should be installed about 20 to 24 inches away from the gas cooktop. Ensure you look at the height dimensions in order to dictate proper mounting. In this case, you buy a hood that you can duct to the outside to completely get rid of the irritants. You can choose to buy a hood that mounts on the exterior wall or the interior wall (island). In the former case, the exhaust ducts will be shorter. In the latter case, the ducts will have to be longer in order to relay the irritants to the outside. With a longer duct, the hood must also be powerful enough to force the air out. The duct system must install correctly for it to work efficiently and to boost the performance of the hood in general. Keep in mind that the hood must not be ducted to a basement or an attic. You must read the installation instructions well to know how the hood will duct. Seek the services of a professional if you are not sure how to go about this. In this case, ducting is not necessary. Instead, the air is forced through an activated charcoal filter to trap irritants as well as other impurities. The air is then allowed to flow back to the kitchen. If you decide to go with this type then you may need to change the filter often in order to ensure the air is constantly pure. These are versatile range hoods that allow either option (ducted and ductless). These models seldom come with a filter. So, you will be required to buy a filter separately. However, experts recommend that you duct to the outside to get the better result. The second most important consideration should be the type or design of the hood. 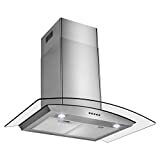 Here, you can choose among under cabinet hoods, wall-mounted hoods, chimney hoods, island hoods, downdraft hoods, range hood inserts, pro hoods and custom range hoods. However, the most common designs are the under-cabinet, wall-mounted and chimney hoods. You can also personalize a range hood to meet your preferences. This type of hoods attaches to the underside of the kitchen cabinets overlying the gas cooktop. They can also be called wall-mount if they install to the wall and not the cabinets. Under-cabinet woods are available in multiplicity of designs, colors, styles and sizes for you to choose from. These are essentially the under-cabinet types that are so-called wall-mount because they only install to the wall instead of the overlying cabinets. They are also available in many sizes, styles and designs for you to find your preference. These kinds of range hoods can mount to the wall just above your range or on your ceiling above an island. A flue then goes up the wall towards the ceiling. This type will force you to move any cabinets you have above your range to make way for its installation. Only by removing them can the hood install correctly. The air movement or power of a range hood is always measured in terms of cubic feet per minute (CFM). 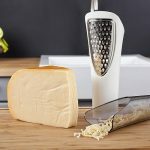 It determines the efficiency of the hood in sucking up or venting irritants from your kitchen. If you are a fancy cook that does a lot of heavy cooking involving strong odors, steam then goes for a range hood of 350CFM or above. A simple calculation is based on your burner output in BTU (British Thermal Units). Generally, a minimum 1CFM of ventilation should be available for at least 100 BTU. For instance, if your burner or cooker output is 50000 BTU then you should look for a range hood capable of providing at least 500CFM. However, you need to be mindful that higher CFM is consistent with a louder operation. A very loud range hood is not good for installation because such sounds may be disruptive. The sound that comes from range hoods is measured in terms of sones. Generally, one sone is equal to the sound you hear when a refrigerator is running. Normal tone conversations are approximated to measure about 4 sones while that of light road traffic is measured at 8 sones. Manufacturers of range hoods usually label their products with the loudness measurement in sones. Be keen to buy one that is not so loud. This may become a challenge because the lower the loudness measurement the lower the CFM measurement the hood will have. Therefore, you must balance between sound and power. Ducted types of hoods are fitted with aluminum filters to trap any grease before odors and smoke are forced outside. Some models may feature stainless steel filters. It is you to decide what works best although the difference may not be big. However, you must remember to wash the filter in the dishwasher monthly to ensure filtering efficiency. In case your cooking involves a significant amount of grease (such as wok cooking or frying) then you should wash the filters more often. Ductless hoods usually use charcoal filters to remove grease, odors, and smoke. Unlike aluminum or stainless filters of the duct types of the range hoods, the charcoal filters are not washable. To serve you effectively, you will have to replace them monthly. If you are looking for the best range hood for you then features of convenience are a must. The most important of these features is an automatic shut off, change filter indicators, a heat sensor, and lighting. A range hood featuring a majority of these capabilities is a great option. 1. What Is The Best Range Hood? From our research, the Broan 413004 Under-Cabinet Range Hood is the best. The reasons why we think is the best include durable stainless steel construction, advanced filtration system, stylish design, quiet operation and competitive prices. There are other great features that set it above its competition. 2. What is the recommended CFM for a range hood? About 350 CFM is good enough for most kitchen cookstoves. However, experts recommend that you base the CFM measurement on the output of your burner measured in British Thermal Units (BTU). 1 CFM of ventilation is recommended for each 100 BTU. 3. Which are better, ducted or ductless range hoods? Ducted range hoods vent to the outside. 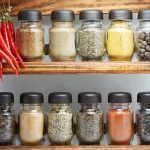 This makes them better and more efficient at ventilating the air in your kitchen. 4. 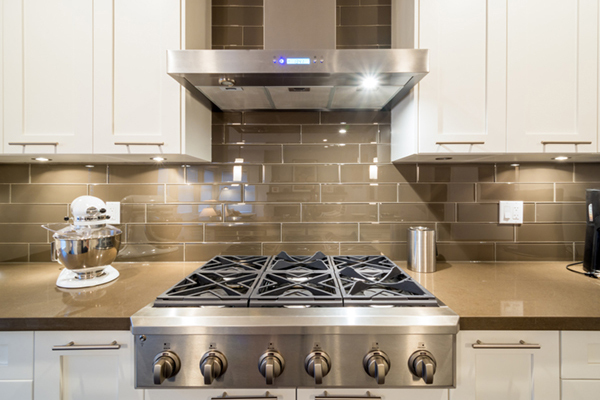 Why Do You Need A Range Hood? According to the United Nations, nearly 2 million lives are lost yearly in the world due to toxic cooking smoke. The smoke also contributes to some of the dreaded chronic illnesses such as cancer. Such smoke is even more dangerous if you have young children in your house. Failing to vent the cookstove smoke and odor could predispose your children to pneumonia. In some cases, your children could sustain burns. The smoke is very dangerous for pregnant women too. It can cause the pregnant woman to give birth to a low birth weight baby. Other conditions associated with cookstoves smoke are bronchitis, cataracts, emphysema and cardiovascular disease. As you can see, finding the best range hoods in the market saturated with tens of brands is not easy. We have tried to simplify your work as much as possible. It is our hope that you will come to the right decision when you finally make your mind to buy a suitable range hood for you. Regardless of our recommendation, each of the range hoods we have reviewed is great. In case you are still confused, speak to an expert in range hoods to help you make the right choice. Do not gamble with this decision because your health and that of your family depends on it.